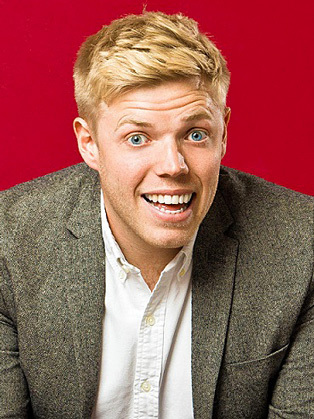 Rob Beckett burst onto the comedy circuit only a short while ago but within his first year he had won four new act competitions including Amused Moose Laugh Off 2010, Outside The Box New Act of the Year 2010, Leicester Square Theatre New Act of the Year 2009 and Reading Comedy Festival New Act of the Year 2009 as well as being nominated for the prestigious Adelaide Fringe Best Newcomer Award 2011. After quickly establishing himself on the circuit Rob’s cheeky chappy persona saw him winning fans starring on BBC1’s Live At The Apollo, Would I Lie To You, Channel 4’s 8 Out Of 10 Cats, BBC2’s Mock The Week, ITV2’s Celebrity Juice as well as his role as resident comedian in the jungle each year on I’m A Celebrity Get Me Out Of Here Now! Rob’s debut tour, which finished in spring 2014, saw him playing to sell out venues all over the UK with dates being added due to the phenomenal demand. Outside the realms of stand-up Rob is also an actor having recently starred in Channel 4’s Fresh Meat.